PROMMATA, whose head office and workshop are located in the old railway station of Rimont in Ariege (France), was established primarily to serve and support farmers working with draft animal power. PROMMATA currently has 350 members and offers several activities: supporting and advising project developers, informing people by publishing "The Members Letter’, building and promoting the Mamata. PROMMATA’s approach is purely associative : non profit spirit and goals, democratic management, small scale. Resources come from members (gifts and subscriptions), tools sales, and the formations we give. We spend a big part of our time researching, designing, testing and finishing new tools in our workshop. 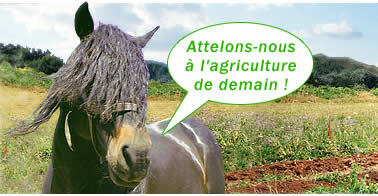 We share information and give formations for farmer working with draft animals. In our international missions, the goal is still the same : sharing and mutual assistance between farmers by transfering simple, cost efficient, DIY, and locally adapted tools.